Wonderful views of city and mountains, easy walk to Gorge, close to everything. 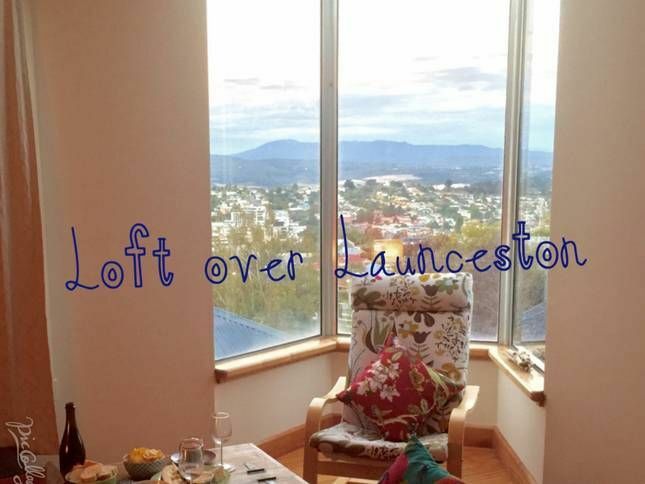 Loft over Launceston is a creative and peaceful space with great views over the city of Launceston and, to the North East, the lovely mountain ranges beyond, including Mt Arthur, Mt Barrow and the ski resort Ben Lomond. It's a short walk to First Basin and its famous chairlift. From there some very pleasant trails take you directly to Cataract Gorge where you can relax and enjoy the spectacular scenery, catch a boat ride, or take as many walks (from easy to challenging) as your legs will accommodate. Loft over Launceston is well equipped for your short break away. There's ample room to stretch out in the open-space lounge and dining area, and the observatory window is just perfect for whiling away some time over a book and a favourite drop. Home chefs won't be disappointed by the carefully designed and well-stocked kitchen, and the laundry with washing machine and dryer will get today's bushwalking gear ready again for tomorrow's adventure. When you confirm a booking with us, we'll send you some additional information to help you make the most of your stay, including local dining tips, and activities and destinations to suit a variety of fitness levels, budgets and time frames. You'll also receive a link to our Loft over Launceston smartphone app so you can take it all (and a bit more) with you as you're out on the go. Loft over Launceston has been newly refurbed in the style of 'pre- and post-modern eclectica' - atleast that's what Anne calls it, but I think she's having me on! The pictures will tell the story. There is a small veranda at the back of the loft leading to a private courtyard where you can enjoy a drink and a bite to eat. Launceston doesn't get really hot so the fans provided are quite adequate with a window open here and there. Loft over Launceston is really a space for 2 people but you could fit a child or petite adult on the double sofa bed in the lounge. Please call to discuss. You have access to the full upstairs loft - bedroom, bathroom, full kitchen, open plan dining and lounge area, verandah and private courtyard. Guests also have access to the laundry cupboard in the garage below the loft. Loft over Launceston is a couple's retreat away from the noise of the city centre. The Loft is on a shared location with a main house occupied by a lovely young professional couple and their Staffie X, 'Axel'. Guests are not required to have contact with the main house as that is a separate, private establishment not associated with the Loft. Residents of the main house use the garage under the Loft - we ask that you respect their privacy and their property whilst you are downstairs using the laundry. * There may be a car parked in the garage underneath the Loft but guests will still have access to the laundry. * The Loft is not wheelchair accessible and would be better suited to guests without mobility challenges (see photo of stone steps). We welcome any opportunities to help you by phone, text, email or through the Stayz email system. Our caretaker lives next door and may be able to assist in an emergency. (We'll share contact details with you once your booking is confirmed). 1. Loft over Launceston is a non-smoking property. Guests may smoke outside but must remove any evidence of smoking. 3. Parking is on street as the garage is used by the folks in the main residence. Parking on the street is at your own risk so we recommend locking your car and stowing valuables safely. 4. No pets / animals are permitted on premises other than a registered canine assistance animal (per C'th Disability Discrimination Act 1992 amended 2009). Bringing a canine assistance animal must be negotiated with us before the rental is accepted. We are just a short walk to First Basin chairlift, less than a kilometre by foot from Cataract Gorge and about 1.5km from town. There is an IGA supermarket within easy walking distance. There is a Metro Bus stop just 50 metres around the corner. Tickets can be purchased from various outlets or you can buy a Green Card and top it up online or at the nearest Metro Bus outlet. We'll send more details in our supplementary guest info pack, once your booking is confirmed through STAYZ. We stayed at the Loft for a week mid May 2018. The attention to detail is second to none. The property is well maintained, very clean and tidy. The kitchen is fully equipped so you can choose to prepare as many meals as you want on site. Or you can choose to order in and take advantage of the wonderful books and other reading material on hand to fully relax and unwind. The vista from the viewing window is ever changing and inspiring. Watching the dark rain clouds over the city and mountains while warm and cosy at night, to enjoying the sunrise in the early hours of the morning well and truly makes this home away from home the best place to stay. We would like to thank the owners and the caretaker, as their attention to detail made for a very comfortable, warm and inviting place to stay and unwind while exploring the wonderful sites of Launceston and surrounds. Thank you so much. We will definitely will stay again whenever we have the opportunity. 10 out of 10. We recently stayed at the Loft and it was exactly what we needed. A home away from home while we were exhibiting at AGFEST. Just enough space, lovely kitchen and you can't beat the view ! The Loft is a home away from home! The views are superb, the furnishings funky and comfortable, the Gorge just a short walk away, very comfy bed, fully equipped kitchen. It has everything you need. The hosts respond quickly to any query and are very welcoming; even though far away. From the start when we booked the Loft, we received great information from Philip and Ann on the property and all of the local attractions. We arrived late, but the property was well prepared for us and we thoroughly enjoyed our stay. The location is ideal, directly between the City Area and the very impressive Cataract Gorge. The property has lots of interesting quirky design details and was very comfortable. What a find! The "Loft" is homely, quirky, extremely well equipped and in an excellent location. We loved all the special eclectic surprises. The communication from our wonderful hosts, Anne and Phillip, from start to finish was second to none. Hello Chris, we're so sorry we didn't see your lovely comments until just now! Your kind words mean a great deal to us. Tasmania is such an exceptional place and we're so pleased to be able to help folks see more of it. Must say, though, you come from a pretty nice part of the world yourselves! When you venture back down our way again, you'll be most welcome at Loft over Launie! Axel says 'hello' and hopes you finally caught that errant suitcase. Very best wishes, Anne and Phillip.